Foothill Music Theatre’s production of “Shrek The Musical” has a lot to like. In this fanciful tale, based on the 2001 DreamWorks animated film, the ogre is the good guy, a donkey talks, a dragon sings, a princess finds true love, and fairy tale characters unite against their oppressor. FMT delivers the goods with imaginative costumes by Julie Engelbrecht, lively choreography by Riette Burdick (with a tap number by Deb Leamy) and solid musical accompaniment by music director-keyboardist Rick Reynolds and 12 other instrumentalists. In this story from a book by William Steig, Shrek the ogre (Andrew Ross) finds his comfortable solitude interrupted by fairy tale characters. They have been banished from Duloc, their homeland, by the evil, height-challenged Lord Farquaad (Joey McDaniel). 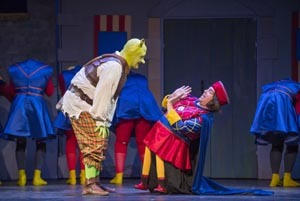 To get rid of them, Shrek agrees to confront Farquaad. As he travels toward Duloc, he’s joined by the garrulous Donkey (Nick Kenrick). When they get to Duloc, Farquaad promises to deed Shrek’s swamp homeland to him if Shrek rescues Princess Fiona (Jocelyn Pickett), whom Farquaad wants to marry so that he can become king. However, she’s imprisoned in a tower guarded by Dragon and molten lava. Here’s where some theatrical magic appears. Dragon is a long puppet maneuvered from beneath by four people and sweetly voiced by Jennifer Martinelli. Though she’s in the pit, it sounds as if she’s actually inside the puppet, thanks to Andrew Heller’s sound design. Dragon’s threat is erased when she and Donkey become chummy. After that, Fiona is rescued. She and Shrek are attracted to each other, but a misunderstanding brings her perilously close to a big mistake until Donkey discovers and reveals her secret. Happy ending. Among the principals the standouts are Ross as the low-key, likeable Shrek; McDaniel as the hilarious, strutting Farquaad; and Pickett as the complicated Princess Fiona. On the other hand, director Milissa Carey allows Kenrick’s Donkey to be too annoying and animated and some of the fairy tale characters too shrill. There’s also a juvenile scene involving prolonged belches and flatulence. Back on the plus side, Carey does a good job of helping all in the large cast to embody their characters. Also among the pluses are David Lindsay-Abaire’s book and lyrics along with Jeanine Tesori’s ear-pleasing music, augmented by Neil Diamond’s familiar “I’m a Believer” at the end. The flexible set is by Lynn Grant with lighting by Michael Ramsaur. Running just over two and a half hours with an intermission, “Shrek The Musical” offers a mix of pluses and minuses, but most of the opening night audience, which had many young people, seemed to enjoy it. It will continue through Aug. 6 in the Smithwick Theatre at Foothill College, 12345 El Monte Road, Los Altos Hills. For tickets and information, call (650) 949-7360 or visit www.foothill.edu/theatre.